Academician Vladimir Eliferevich Nakoryakov is an outstanding scientist in the field of thermophysics and physical hydrodynamics, the author of more than 400 scientific publications, including 11 monographs. Many of his monographs are translated to English and German. He has prepared 2 corresponding members of RAS, 45 doctors, and over 250 candidates of sciences. V.E.Nakoryakov has made a large contribution to the development of the theory of the physicotechnical bases of power technologies: hydrodynamics and heat exchange in gas-liquid streams, wave dynamics of the biphase media, non-stationary processes in multiphase systems, convective heat and mass transfer in porous mediums, burning, and heat and mass transfer. Recent years his interests are in the field of the theory and experiment for fuel cells and hydrogen generators. Academician V.E.Nakoryakov, together with academicians Ya.B.Zeldovich and S.S.Kutateladze, is the author of the discovery "the Phenomenon of the formation of underpressure shockwaves". V.E.Nakoryakov has laid the groundwork for the theory of absorption heat pumps, he designed a series of the directions of ecologically pure power and energy-efficient technologies. Under his guide, efforts are underway into promising directions of hydrogen power industry. V.E.Nakoryakov worked as the vice-president of the Siberian branch of RAS, director of the Institute of thermophysics of SB RAS, the rector and the Head of a sub-faculty in Novosibirsk state university and the Head of a sub-faculty in Novosibirsk electrotechnical institute. At present, V.E.Nakoryakov is the adviser of RAS, the principal scientific associate in the Institute of thermophysics of SB RAS, he heads ANO "the Institute of the advanced research", where the works are performed into hydrogen power industry and into mathematical problems of economy, and he heads the special design bureau of "the Institute of the advanced research", that produces heat pumps and new types of apparatuses for agriculture. He is the member of the International committee on heat and mass transfer, National committee on heat and mass transfer, the American society of mechanical engineers and the American physical society, and of many other national and foreign science foundations and committees; he is the member of editorial boards of 12 scientific magazines, the chairman of two specialized doctor's scientific councils; he publishes "Journal of Engineering Thermophysics" for 13 years. 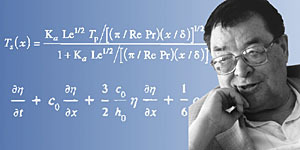 For four times, academician V.E.Nakoryakov was the expert of the Nobel committee in the field of physics. V.E.Nakoryakov is the winner of the State premiums of the USSR and RSFSR; he has been awarded with many orders and medals, including the order "For the merits for the motherland" of the IV degree. * Istochnik: Akademiku V.E.Nakoryakovu - 70 let // Vestnik Rossiiskoi akademii nauk. - 2005. - T.75, N 10. - S.967. Dokument izmenen: Wed Feb 27 14:46:40 2019. Razmer: 9,161 bytes.